Buy. Sell. Simple.Join the largest mobile marketplace for local buyers and sellers! OfferUp makes it easy to find great deals on the things you want and make money on the things you want to sell. Ditch the Classified Ads and garage sales -- this is the best way to buy and sell in your community or neighborhood with people you can trust.How it works:• Buy or sell anything; easily offer up your items for sale in 30 seconds. • Find great deals and discounts on clothes, furniture, cell phones, electronics, baby & kids items, sports equipment, used cars and more.• Use reputation features like ratings and profiles to see who you’re dealing with and build trust. • Browse local items for sale with thousands of new postings daily. • Message buyers and sellers securely from within the app. • Build your reputation with your unique seller profile page. • Browse items by image and sort by category or location. • Join millions of people using OfferUp across the country. • Skip the garage sale! OfferUp is the simplest way to buy and sell locally.Fun facts about OfferUp:1. 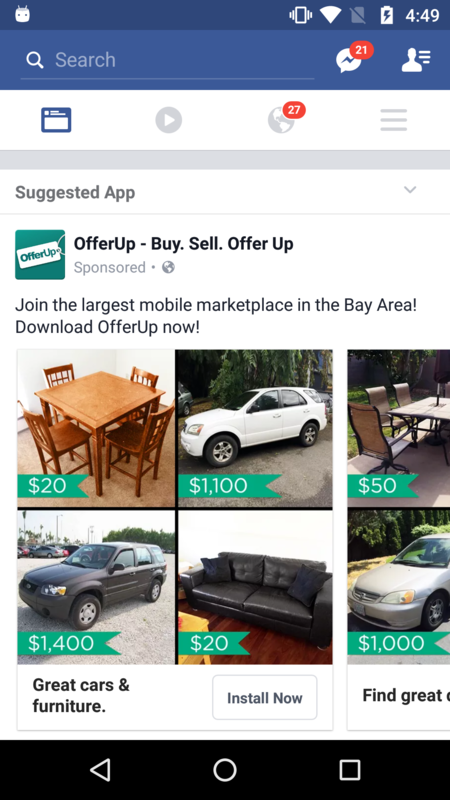 With OfferUp you can easily sell anything, from clothes to used cars to electronics.2. OfferUp shows you what’s selling nearby, right in your neighborhood. 3. Communication between buyers & sellers happens through the app via secure messaging.4. OfferUp is better than a garage sale; find anything you want at a discount, right on your phone or tablet.Be part of the community: We’re making local buying and selling an experience that everyone can try and trust. The community at the heart of our marketplace is what makes that possible. When you join OfferUp, you’re joining millions of people helping each other make money and save money around the nation -- and right in the neighborhood.